Have you watched the new season of Chef’s table on Netflix? It is not to be missed, especially that second episode starring Corrado Assenza from Caffe’ Sicilia. The episode is magical. It is enticing and inspiring, just like Corrado. In fact, Corrado has been a source of Gustiamo’s good food inspiration for decades! Gustiamo has been friends with Corrado for about 20 years. We import his Torrone Nougat, Jams + Marmalades, and the Noto Romana Almonds + Bronte Pistachios that he sources for his pastry shop. Here’s the link to all the Corrado Assenza Caffe’ Sicilia products that Gustiamo imports. The episode is narrated in part by our friend Faith Willinger. 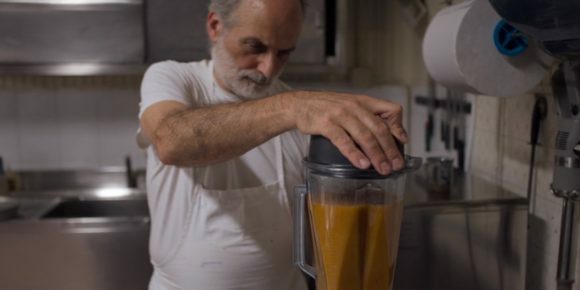 One of our favorite parts of the episode is when Corrado shows his process for making Apricot Jam, from tree to jar. This is a picture of him above, making that jam. As Faith points out, the thing that influences Corrado the most “is his island… he knows the history of every single ingredient he’s working with and that’s what has made him so special. He’s Mr. Sicily.” Corrado is obsessed with his raw materials and you can definitely taste that, for example, in his Apricot Jam. This jam is transformative. It is bitter and sweet, intensely apricot, complex and comforting. For anyone who loves Caffe’ Sicilia and the Assenza family, this episode comes with a bit of heartbreak. Recently Corrado’s brother and partner, Carlo Assenza, passed away. We so wish that Carlo could have had the opportunity to appreciate this masterpiece Chef’s Table debut. Carlo was an important advocate for Sicilian almond cultivation and without his work Caffe’ Sicilia would not be what it is today.